I have been interacting quite a bit with the Pagan community over the Internet in promotion of Beyond the Burning Times: A Pagan and Christian in Dialogue (Lion Hudson, 2008), and as a result, one of my Pagan contacts asked me if I was aware of a new book by Dillon Burroughs and Marla Alupoaicei titled Generation Hex: Understanding the Subtle Dangers of Wicca (Harvest House, 2008). I had not heard of the book previously, and after contacting Marla and the publisher they graciously sent a review copy. Generation Hex is a volume addressed to an evangelical Christian audience, and it is divided into two main sections, the first addresses "What is Wicca? ", and the second moves to a response with "What Should I Do About Wicca?". The first section of the book involves nine chapters that address why evangelicals should be concerned about Wicca, its popularity, its origins, teachings and practices, its concept of the divine, female involvement in Wicca, the story of a former Wiccan turned Christian, and its concern for the environment. The second part of the book includes six chapters and a frequently asked questions section. This book incorporates several positive features, including the authors' interviews with Wiccans as part of the research process for the preparation of the book, a recognition that many Wiccans and other Pagans have had negative experiences with Christians and churches to which Christians should be sensitive and self-critical, and a desire to move beyond and correct stereotypes of Wicca perpetuated by Christians. Yet despite these commendable aspects I found several elements in the book problematic. The marketing for the book, as reflected on the back cover, presents the volume as "an eye-opening expose of Wicca," a sensationalistic way to describe a treatment of a spiritual pathway that is open to examination by anyone interested in talking to its practitioners, reading their books, or consulting the growing body of academic literature on the topic. Since an expose is unnecessary, this sensationalistic tone used by the publisher fuels the tabloid-nature of evangelical treatment of new religious movements and detracts from the credibility of the volume. As Generation Hex sets forth its initial case as to why Christians should care about Wicca it does so by pointing to Wicca's increasing popularity. The book states that, "Studies confirm that Wicca is the fastest-growing religion in America. By some estimates, it will become America's third-largest religion by 2012 (after Christianity and Judaism)." In order to substantiate this claim the authors cite Wiccan author Phyillis Curott to the effect that there were "between three and five million Wiccans [living] in the United States by the end of 1999." The authors' use of demographic data is is fraught with difficulties in that the claim that Wicca is the fastest-growing religion, poised to be the third largest in the U.S. by 2012, can be traced to a press release by evangelical writer Steve Wohlberg. I have addressed this topic previously, but Wohlberg's press release makes the case for Wiccan growth by mere assertion, with no demographic studies cited to support the claim. In addition, Burroughs and Alupoaiccei include an endnote reference to this sidebar that points readers to the 2001 American Religious Identification Survey which estimates the Wiccan population at 307,000. Even if this statistic is on the conservative side, it comes nowhere near the number need to justify Wohlberg or Curott's claims as to the numbers of Wiccans in the United States. Unfortunately, Burroughs and Alupoaicei have engaged in a poor use of demographic data and whether it is intended or not, it will paint an inaccurate and alarming picture for evangelical readers. As the authors continue their discussion of Wicca's popularity, like many evangelical writers touching on the topic, they devote an entire chapter to the alleged role of the Harry Potter novels and films in the rising interest in Wicca. (Elsewhere in the book they share similar concerns over television programs like Angel, Buffy the Vampire Slayer, Sabrina the Teenage Witch, and even the Disney film Hocus Pocus.) One of the chief concerns for these authors is the "disturbing witchcraft-related spiritual themes". Unfortunately, Burroughs and Alupoaicei repeat the hermeneutical error of many evangelicals writing on Potter which results in a misinterpretation of Rowling's works. As C. S. Lewis noted, a writer draws upon diverse sources in the non-fictional world in order to create a fantasy world. These sources may include folklore, myth, legend, and even religious elements. However, these elements take their meaning from within the story in the context of the fantasy world as defined by the author, not with reference to their external sources. With this interpretive principle in mind, turning to the Potter stories it is clear that Rowling has created a contemporary fantasy story involving a myth of witchcraft similar to the fairytale depictions of the witch from times past, an archetypal figure with no connection to real Wiccans in our neighborhoods. If evangelicals want to be taken seriously beyond their subculture they will have to exercise more caution in their engagement with fantasy media, and they will have to exercise even greater caution in their attempts at connecting the dots to new religious movements. As the authors consider Wiccan teachings, much like their concern over Potter-mania, they also mention their concern over Halloween and its allegedly dangerous influences on American society. More careful reflection on the historical and cultural development of Halloween, and its present expressions in American culture, would have revealed the secular nature of this increasingly popular holiday, and its lack of connection in any serious way to the teachings and practice of Wicca. This misinterpretation of Halloween represents another hermeneutical error in properly interpreting an aspect of popular culture. Also in this section of the book the authors present a "quick-reference guide" on Wicca's "core beliefs," which are then presented in summary form in relation to the categories of God, Jesus, the Holy Spirit, the Bible, sin, salvation, angels, and the afterlife. Burroughs and Alupoaicei would have assisted their evangelical readers in this section by noting that Wicca is more properly construed as a spirituality involving ritual rather than belief at its core, and this is not mentioned in relation to the quick-reference guide, or in the later chapter on Wiccan belief. In addition, when discussing some of the beliefs found among Wiccans, in order to understand Wicca from an empathetic perspective of a Wiccan practitioner, it would have been helpful for the authors to discuss Wiccan beliefs using their terminology and priorities for belief rather than those of the evangelical. Granted, this book is written for evangelicals, however, it must find a way to accurately communicate the essence of Wicca in ways recognizable by Wiccans for evangelical outsiders. One final concern I had about this volume was its hesitancy to move completely beyond stereotypes of Wicca. As noted above, the authors do point out many of the stereotypes associated with Wicca and they seek to provide a corrective, but they don't accomplish this completely. For example, in a chapter where the authors discuss the surprises they encountered in their research for the book, one of the authors (Burroughs) addresses one of the surprises he encountered in terms of alleged links between Wicca, Satanism, sexual promiscuity, and child abuse: "I've found these assertions to be unfounded (at least in mainstream Wicca)." I italicized the last portion of the quote to draw attention to the issue I'm raising here. While Burroughs was pleased to discover that Wicca does not engage in the worst of its stereotypical associations, nevertheless, for Burroughs this appears to be the case with "mainstream Wicca," which appears to leave room for non-mainstream or underground Wicca, whatever those may be. A similar hesitancy to move beyond stereotypes occurs earlier in the book when the authors dispel the myth that Wiccans worship Satan. The authors correctly assure us this is not the case, and yet they include the additional notation that "Most Wiccans don't believe in the existence of Satan." My emphasis, again, but most? I have yet to encounter a Wiccan who does, and to leave this door open a crack represents yet another example of a hesitancy to completely dismiss the stereotypes about Wicca that evangelicals all-too-frequently frequently perpetuate, apparently even in books designed in part to do just that. I really wanted to find this book more helpful for evangelical readers in its presentation of Wicca, especially with Ron Rhodes describing it as "a true jewel of a book" in the Foreword. In my view, while this book represents an improvement over many evangelical treatments of Wicca, Paganism, and other new religions, its shortcomings overshadow any positive elements, and for these reasons I encourage evangelicals to consider other materials for their understanding of Wicca and interactions with its adherents. An excellent review, John. I might have to check out this book myself. As for your comment about encouraging other evangelicals to look to other sources to inform their understanding of Wicca, I tend to agree. But the comment got me wondering about the dubious nature of relying on any book written by a non-Wiccan for information about Wicca. In reality, this can be applied to any religion. For example, if I wished to know more about Christianity, I would be more inclined to go directly to Christian sources rather than read a book about Christianity that was written by a Wiccan, a Buddhist, or an atheist. To me, it only makes sense. This isn't to say that there isn't value a place for books about a given religion that are written by those who aren't adherents of that religion. However, it seems to me that such value revolves around comparisons between religions and how different religions and their adherents might respond to one another and co-exist. That is still best built on an understanding of each religion that is best gleaned from its adherents. Of course, part of me also wonders why someone would choose to get their information about another religion "second-hand," so to speak, and what implications the answers to that question might ultimately hold. Jarred, thank you for your thoughts. I agree with you that many times we seek out second or third hand sources of information about other religions, when we seek out sources to move beyond our ignorance at all. In my experience, most evangelicals read materials by other evangelicals on non-Christian religions for a variety of reasons, probably most often due to fear of engaging primary sources. By all means, we should first engage in dialogue with adherents of various religions first, and then seek out the materials adherents have written about their own spiritual pathways. This can be followed by engaging good academic literature on the topic, and then evangelicals can consider reviewing secondary sources by evangelicals on such topics, but they must be very discerning as the track record is rather poor here in the popular market. "I have yet to encounter a Wiccan who does..."
Great review John. You confirm what I suspected the book would contain. As for Satan, while I don't personally believe in a personification of ultimate evil, I believe that Christians believe in it. So I suppose that could be construed as a sort of belief once-removed. Also: "mainstream Wicca", hilarious! It reminds me of those old slurs that claimed the rank-and-file Wiccans didn't believe in Satan until you "advanced" far enough in the secret hierarchy (a hierarchy seemingly pierced only by Wiccans who have turned to Christ). Thanks for your comments, Jason. A review of the authors' websites indicates that they have begun interviews on Christian radio stations where they are perpetuating some of the problematic aspects of the book. This may only increase with the approach of Halloween, but my hope is that the work of other Christians on Neo-Pagan studies can provide a balance for such things. What an unexpected delight! I am so pleased, not just by your thoughtful review of this book, but by the clear and level-headed way the other articles you've posted hear approach religious dialog. I would, inevitably, have ordered _Beyond the Burning Times_ anyway, as a die-hard fan of Gus DiDerega's. But now, with double the reason to want to read the book, I'm afraid I'm going to have to hold you personally responsible for my going over budget on book buying this month! Thanks for the review. I'm glad it was featured at The Wild Hunt! Cat (if I may), thank you for your kind comments. I think that interreligious dialogue is one of the key issues and activities of our time, and I am committed to thinking through and exemplifying the best ways to do this with Neo-Pagans and others. We can do so respectfully, while seeking understanding, and yet not compromise our views on important issues. I was pleased to look at your bio and to see your connection with other good Pagan blogs. Please stop by again. Thanks for commenting on our new book Generation Hex. While I appreciate your positive feedback, I wanted to note a few issues I felt were misunderstandings in the process. First, I don't think we ever mentioned our book as "an eye-opening expose of Wicca" as you note. We specifically sought not to be sensationalistic, but rather to present the information about Wicca primarily to a Christian audience in a way that made sense and provided an accurate picture of the movement. Second, the concerns about demographic data were concerns of ours as well. To date, I do not believe any survey has provided a highly-accurate picture of the number of Wiccans in North America. But the point was not to prove a specific number of Wiccans or a certain percentage of growth. These statistics were used as indicators of the movement's rapid growth, nothing more. Third, I think you misunderstand our purpose in discussing the influence of Harry Potter in today's growth of witchcraft. Having read the books and watched the films myself, I have concluded they are well-written and are not out to convert anyone to witchcraft. Our brief argument on this point was to mention that Harry Potter includes many witchcraft elements that parents of young readers (and others) should be aware of before deciding whether to allow their children to read it. Finally, your comments about what I called "mainstream Wicca" should be mentioned. Many Christian writings have lumped Wicca alongside Satanism and related movements, providing extended stories of animal and even human sacrifice. We hoped to provide a corrective to such horrific stereotypes by appealing to the differences in Wicca as practiced in today's society. However, we also had to be honest that there are some who practice some very bizarre rituals, including animal sacrifice, who call themselves Wiccans. Our comments were written in such a way as to show that this is not typically the case. I hope we can agree that there is much room to help Christians and the American public in general recognize the numerous negative stereotypes toward Wiccans. I also hope and pray we share the desire to point Wiccans toward the way of Jesus in their search for true spirituality. Please feel free to communicate with me more if you wish at dillon@dillonburroughs.org. Again, I appreciate your efforts to influence those in the Wiccan community with the love of Jesus. Dillon, thank you for stopping by and sharing your response to my thoughts on your book. I offer the following in reply to my alleged misunderstandings. 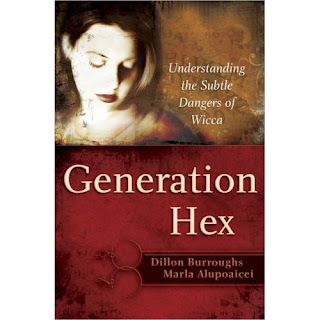 First, the phrase describing Generation Hex as "an eye-opening expose of Wicca" is taken directly from the back cover of your book. As I noted as the first concern in my review, it is just such sensationalism in marketing that initially detracts from the book. I recognize that you as the authors wanted to stay away from such sensationalism, but clearly the publisher has not. Second, in terms of Wiccan growth (and overall growth in Paganism as well), I have no problem with the citation of good demographic data to substantiate this. My concern is that not only did you cite data as to the growth of Wicca, but that you also claimed that Wicca is poised to become America's third largest religion, a claim that simply cannot be substantiated. A little Internet detective work indicates that this claim came initially from an Interet "document" as part of a "Worldseen" series on various worldviews produced by Multnomah Bible College. This was then cited by Steve Wohlberg, a Christian evangelist, and you then picked up the claim (without citing the sources), and now this is being repeated on the radio as if good religious demographic data supports it. Unfortunately, this is a poor use of statistics, and it adds to the concern that the book is sensationalstic. Third, as to the Harry Potter issue (and unfortunate controversy in evangelicalism), I know that you do not believe that Rowling and Potter are recruiting tools for Wicca. My point was that your misreading of Potter (similar to the misreading of many evangelical critics) as portraying real-world Wicca rather than serving as a contemporary fairytale which constructs a new archetype of the witch, fuels not only a poor hermenetuic of literature and film, but also inappropriately connects fantasy and fiction to an important new religious movement. Fourth, as to your comments on "mainstream Wicca," I appreciate your efforts at distinguishing Wicca from Satanism. This is an unfortunate stereotype perpetuated by Christians, as you know. However, the way you worded this clouded the issue and contributed to a misunderstanding, in my view. Your research and ethnographic interviews should have demonstrated that Wicca does not involve animal sacrifices, and if you encountered this it should be understood as a fringe phenomenon. It would be inappropriate to make the distinction between mainstream Wicca and something else, which gives the impression to your readers (as it is worded in your book) that you give some credence to fringe, hidden forms of Wicca that may conform to the stereotypes Christians have of Wiccan practices. I would encourage additional ethnographic research among Wiccans, and expanded reading of popular literature written by them as well. This would be complimented by reading the growing body of academic literature in the field. All of this would help in your understanding and future writing. Finally, I've contributed to my own work in this area having served as the editor of a new book by Gus diZerega (a Pagan and a Witch) and Philip Johnson (an evangelical Christian). The book is titled Beyond the Burning Times: A Pagan and Christian in Dialogue (Lion, 2008), and we hope this serves as an example of a new and better way forward in both the understanding of Wicca and engaging followers of this spiritual pathway. "To date, I do not believe any survey has provided a highly-accurate picture of the number of Wiccans in North America." Then you must not have read the Pew Forum's landmark U.S. Religious Landscape Survey. Based on interviews with more than 35,000 American adults, it is one of the most extensive looks at religious adherence in America. Based on the figures there, one could somewhat confidently state that there are around 1.2 million Pagans total (that includes Wiccans and non-Wiccan varieties of modern or "neo" Paganism). This puts us on par with Hinduism, and slightly smaller than Buddhism. "These statistics were used as indicators of the movement's rapid growth, nothing more." You can't use incorrect statistical data to track a movement's growth. Even if you hadn't heard of the Pew Forum survey, which makes me question how much research you actually did for this book, there are several academic papers and insightful commentaries available that debunk inflated estimations of 3 million or more. A number you reached through flawed math and seemingly uncritical assumptions. Further, on a recent radio interview you trot out the "3 million" and "3rd largest religion by 2010" tropes with nary a qualifier in sight. You pay attention only to the data you want in order to inflate the "problem" of modern Paganism. I'm sure such tactics helps to sell books and get you spots on Christian radio, but it surely doesn't foster better understanding between Pagans and Christians. I just wanted to say I appreciate your honest review of "Generation Hex" most pagans/neo-pagans that I have talked to about the book consider it a bit of a 'joke' and not in a good way. It would be nice if they acquired a real Pagan's perspective instead of an "ex-Wiccan" who seems to be a ex-everything else as well. It would be nice to see someone actually cite reading something by a real Pagan or Wiccan writer or having met with one for an interview, something. Someone strong in their beliefs would help, Ronald Hutton perhaps? Just a thought. Excellent review, John. I think we need less books like this and more like "Beyond the Burning Times". Also I think it's frankly bizarre to classify Wiccan beliefs under Christian topic headings. I know that there are some influences from Christianity in Wicca (as detailed in Wicca and the Christian Heritage by Joanne Pearson) but it makes no sense to classify our beliefs under a bunch of stuff we don't believe in! I'd like to thank those who have come to this site in the last day or so to post comments in light of Jason's discussion of Generation Hex at The Wildhunt. If I could ask a favor, it would be helpful for readers, and the authors of Generation, to hear how respectful and articulate Pagans view this volume. If you would consider posting your comments on the book's Amazon.com page it would be helpful. Just to point out about the Pew study: Unless you want to claim that Pagans, Wiccans and other New Age religions are all essentially the same, you are significantly inflating the Wiccan numbers. The Pew study says that Wiccans represent <0.3% of adult Americans. How much less? We can't know based on this very large survey. "you are significantly inflating the Wiccan numbers"
I very clearly stated that the 1.2 million figure from the Pew Forum survey was only if you included Pagans of every variety (nor am I claiming that they are all the same). I'm not trying to inflate Wicca's numbers, in fact, I'm criticizing those who over-estimate our growth. "However, we also had to be honest that there are some who practice some very bizarre rituals, including animal sacrifice, who call themselves Wiccans." Bull crap. I'd like to see some actual documented proof. Now, there are religious groups who practice animal sacrifice (Theodism in particular), but it is not the urban legend version of animal sacrifice where an animal is cruelly tortured and killed. It is simply slaughtering one's own meat and serving it as a feast, then giving up a portion to the Gods. It's far more humane and wholesome than eating the crappy factory farmed meat that tons of Christians subsist on. I shall assume that you are not referring to ritualized, humane slaughter of livestock. Anyone can call themselves Wiccan, or use Wicca as an excuse for "bizarre rituals [and] animal sacrifice." Anyone can also claim that angels or demons told them to do the same thing. These people are delusional, lying, or both. I am also one who has a problem with the statement that there are Wiccan's who practice animal sacrifice. I have been Pagan for almost 30 years and travelled the USA extensively and not met a single Wiccan or Pagan that does animal sacrifice. They might kill an animal for a feast, but not ritualistically kill. We revere all life, even those of animals. Most pagans thank the spirit of the plants and animals for giving their lives so that we may live before each meal. My core belief would not allow me to kill, except to survive. What you do comes back to you. This is another core belief of ours. Our main tenet is "An it harm none, do what you will." How could you think that any of us would kill for the sake of killing? My God and Goddess would not appreciate that! First of all, I find this blog and its comments very interesting. I hope my comments aren’t too “narrow,” as I focus on Harry Potter-esque literary issues within mainstream Christianity. I am a "Messianic Gentile," for lack of a better term, who believes like a Christian that Jesus of Nazareth is the divine, long-awaited Messiah, but who increasingly follows in his footsteps as his disciples did as first century Jews. I am also a trained Holocaust educator (trained at USHMM and by staff at Yad Vashem). Halloween brings out some very strong spiritual sensitivities that is great for dialogue.